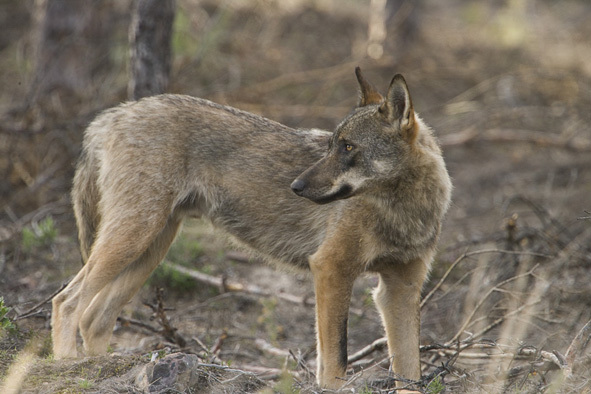 A Spanish researcher has shown that wolves in the Macizo Central Orensano, Galicia prefer roe deer, deer and wild boar, rather than sheep, goats, cows and horses. The researcher, who identified the food type of wolves through their faeces, found “in 87.1% of cases the carcasses of wild hoofed animals appeared, while domestic animals were only found in 11.3%. Lower amounts of remains of carnivorous animals, such as badgers, dogs, cats and rabbits were also found”. The study, recently published in Wildlife Biology, shows that roe deer are the main prey, and were eaten all seasons of the year though particularly during the summer (52%) and spring (26.2%). 62.8% of prey were roe deer (Capreolus capreolus), 12.6% deer (Cervus elaphus) and 10% wild boar (Sus scrofa). The consumption of domestic sheep and goats only represented 7.7% and 2.9%, respectively. The fact that livestock remains are present in excrement samples of wolves is explained by their scavenging habits in the area. No attacks on livestock were reported during the study. One of the most important points in the study that the consumption of wild and domestic animals does not depend on their availability. Wolves preferred roe deer, deer and wild boar ahead of livestock, “in spite of the fact that both food types can be found in large quantities”, Barja adds. “In areas with a low density and diversity of wild hoofed animals where wolves feed on domestic animals, an increase in the number of wild prey, livestock vigilance and limited access to carcasses could force wolves to specialise in the consumption of wild prey and transmit this behaviour to their offspring. Without doubt, this would help to minimise conflict between humans and wolves, and would support the conservation of canidae”, the researcher concludes.